We’ve all been there – you’ve just left the salon and come home to discover your hair has been cut too short! Don’t panic – your hair will grow back! And while you know it will take weeks for it to grow back, you may become desperate trying to find out how to make your hair grow. There are products out there full of chemicals that promise hair growth. 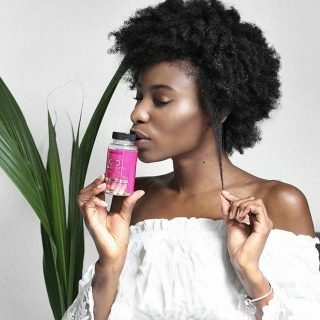 While there is no quick fix to accelerate hair growth, HAIRFINITY Hair Vitamins has a proven formula that is all natural. 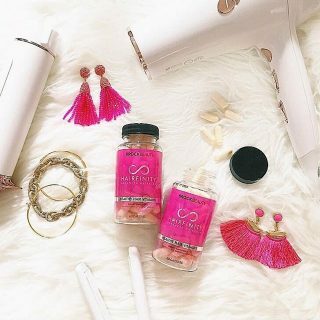 Hairfinity contains no hormones or steroids, but it is full of vitamins and nutrients that improve hair’s overall health and aid in growing hair longer and stronger. Hair normally grows at about a quarter to a half inch every month. Improving the overall health and strength of your hair is the first step to growing the long, beautiful hair that you want. Follow these tips and tricks to get you started on the road to longer hair, naturally. Apply egg whites to your hair: egg whites have been used for years to replenish hair and restore softness and shine. 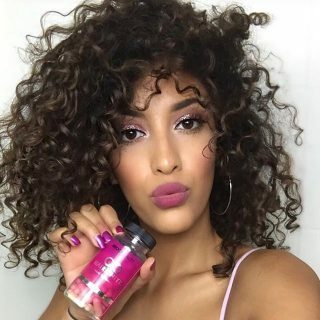 They have also been used to help with hair growth because they contain keratin protein, which helps to rebuild damaged hair by filling in weakened spots along the hair strand. The protein in the egg whites helps strengthen your hair so it does not break easily. By retaining length, your hair can grow longer. Make an egg white mask for your hair, using egg whites and olive oil. Mix the two ingredients together with a fork and apply the egg conditioner to your hair, allowing it to soak in for 10 to 20 minutes. Wash the egg conditioner out of your hair and apply a moisturizing conditioner, rinsing well. Scalp massages: Use a store bought or homemade hot oil treatment to make your hair grow faster and make your strands look shiny and healthy. Massaging the scalp increases blood flow to the hair follicles, which brings much needed nutrients to the hair and encourages hair growth. Heat up the hot oil and rub it directly onto the scalp, leaving it on for about 15-20 minutes; then spread the oil over the length of your hair. Leave it on for another 30 minutes before you rinse out thoroughly – you’ll notice your hair will feel thicker, softer and will be on its way to becoming longer. If you decide to go with a homemade treatment, choose oils such as jojoba, coconut or olive oils. Alternatively, you can also do scalp massages without oil. Drink water: Drinking water helps to keep you hydrated and helps your body flush out unwanted toxins. The skin and hair are the first and most noticeable areas of dryness from dehydration. Staying hydrated will help your hair become stronger and less likely to break – which is essential for hair growth. Eat an adequate amount of protein: What you eat can make a huge difference in how your hair grows. Eating a lot of protein-rich foods can improve the quality of your hair and speed up hair growth. A strand of your hair is essentially made up of protein, which means that you need to consume the right amounts of protein to give your body what it needs to stimulate new hair growth. Conversely, a diet low in protein can lead to poor hair health. An adult woman should consume at least 5 ounces of protein per day, or more if you exercise more than 30 minutes a day. Focus on eating things like fish, eggs, fresh fruits, vegetables and different meats to begin to notice a difference in the growth of your hair. Apple cider vinegar: Apple cider vinegar stimulates your hair follicles, which help to make hair your hair grow. It also removes dirt, grime and residue left behind from your hair care products. Apple cider vinegar is also used to naturally detangle hair and improve shine. To use, mix apple cider vinegar with some water and use it as a rinse on your hair after you shampoo. If you’re concerned about the odor from the vinegar, add a few drops of essential oil to the vinegar before you rinse. Biotin: Biotin is a form of vitamin B that is present in foods like eggs, soy and whole grains. A deficiency in biotin has been shown to cause hair loss. Consistent and long-term use of biotin will result in healthier roots and follicles as well as stronger fuller hair. This means that your hair will not break as often and hair will grow longer as a result. Most adults need about 30 micrograms of biotin per day to maintain the health of their hair. 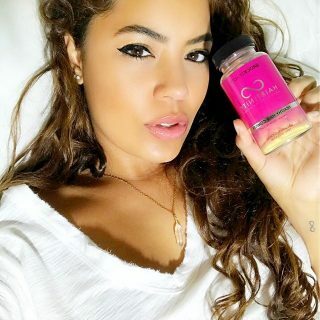 If you don’t feel that you’re getting enough biotin from your diet, try taking a supplement that contains biotin and other vitamins that promote hair growth, Hairfinity hair vitamins is one such vitamin that is biotin rich.. Biotin is an essential vitamin needed to make your hair grow. Omega-3 fatty acids: Your body needs Omega-3 fatty acids to produce hair as hair is made up of 3% fatty acids. Your body can’t produce these on it’s own so you need to be sure you are including some form of Omega-3’s in your diet, either through food or supplements. Fish, such as salmon, and nuts, such as walnuts, are excellent sources of Omega-3’s. Conditioner: For strong, healthy hair, use a deep conditioning treatment at least once a week. This will help keep your scalp and strands healthy. Use a conditioner on your hair every time you shampoo, but make sure you don’t apply conditioner to your scalp as it can weigh your hair down and cause dandruff. When selecting a conditioner you should make sure that it is gentle paraben free conditioner. HAIRFINITY Haircare has an aloe based formula and contains no synthetics. Growing long healthy hair starts with a healthy scalp. When you do apply conditioner, make sure you are only applying it to the lengths of your hair, from about mid-length to the ends. Hair care while you sleep: It might seem obvious, but caring for your hair truly is easiest while you sleep. That being said, in order to care for your hair, never sleep with a tight ponytail or tight braid as it can cause breakage and pain in your scalp. Instead make a loose ponytail and try sleeping on a silk pillowcase. The silk pillowcase won’t cause friction and it’s much nicer on your hair than a cotton pillowcase. Don’t blow dry: It might be difficult, but try not to blow-dry your hair everyday. Daily exposure to high heat from your blow dryer (or even your straightener) can be quite damaging to your hair. Continuous exposure to heat can cause split ends, frizzy hair or dryness. By reducing your exposure, hair will be healthier and you won’t have as many split ends. Healthy hair = hair that grows faster! Grapeseed oil: Grapeseed oil contains anti-oxidants that may help block the production DHT, a hormone known to cause hair loss. Grape Seed oil also contains Vitamin E, which helps to build tissue, and linoleic acid, both of which promotes hair and skin growth. If you hair is brittle or weak, try treating it with grapeseed oil to restore strength and shine. To use, massage your head with warm grapeseed oil and leave it on overnight, washing it out in the morning. Or try mixing a few tablespoons of grapeseed oil with a drop or two of jojoba oil and rubbing it into your scalp, rinsing it out after 10 minutes or so. Coconut oil has similar benefits for hair growth. 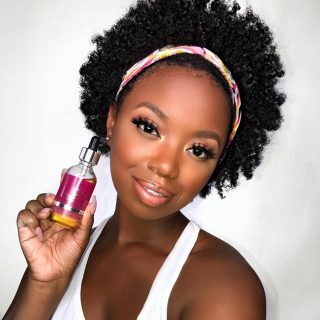 Natural hair care products: The best way to start on the road to healthier, longer hair comes from using all natural hair care products. Stay away from silicone based hair products, as they tend to be bad for your hair in the long run. Silicone based products coat the hair shaft and seal out moisture, clogging hair follicles and eventually preventing your hair from faster growth. Silicone based products are not the only ones to avoid. Also avoid any products with sulfates. These harsh chemicals make your hair weak and brittle, causing breakage, which can keep you from growing long, beautiful hair. 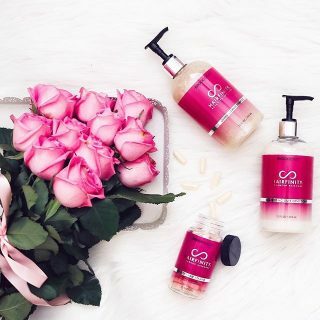 Use shampoos labeled paraben and sulfate free and avoid shampoos with SLS (sodium laurel sulfate) listed in the ingredients. Hairfinity Advanced Haircare are natural, sulfate free options that promotes hair health. Washing your hair: While washing your hair everyday may seem like the right thing to do, it’s actually more beneficial to wash your hair every 2-3 days. Spacing out your hair washes will allow your hair to produce the natural protective oils necessary for hair growth. The type of shampoo you use is as important as how often you use it. A natural cleanser that contains no sulfates is your best option, our Gentle Cleanse Shampoo has an aloe vera based formula that cleanses and helps hair retain moisture. Try washing your hair in cold water as washing in hot, steamy water can damage the hair shaft, leading to hair that is brittle and more prone to breakage. If a cold shower just doesn’t work for you, try washing your hair with warm water first, then finish your shower off with a cold rinse. Use of hair products: Every now and then we need to use styling products to tame our hair but sometimes the best thing for your hair (and hair growth) is to avoid using products of any kind. The more you use styling products, the more damaging to your hair they can become. Instead of using styling products, style your hair as usual and finish off your look with a cold blast from your blow dryer. This will help to set your style without the use of products. Take vitamin supplements: taking vitamin supplements will help ensure that your body has the right amount of nutrients it needs to produce longer hair. While eating a well-balanced, healthy diet should be enough, vitamins can help to ensure you are getting the right amount of each and every vitamin needed for strong, healthy hair. Hairfinity hair vitamins contain vital nourishment that your hair needs for health and growth. Get plenty of sleep: Regular sleep cycles help your body regulate melatonin and cortisol levels, both of which affect hair growth. Sleep is necessary for our general health and wellness and when your body doesn’t get enough, it begins to shut down side processes like hair production. Hair styling techniques: Avoid wearing tight hairstyles like ponytails everyday, as these can pull hair and hinder growth. The strain on hair from tight styles can cause hair to weaken and break. It also puts strain on the scalp itself by inhibiting blood flow and can cause hair loss at the sight of the strain. Use looser styles whenever possible and avoid hair ties with metal pieces as they can catch and pull on hair. Trim split ends: While this might seem counterintuitive, as cutting your hair is what caused you to want to grow your hair out in the first place, it is important that you cut off any split ends. Trimming your ends will not make it grow, but it will make it look healthier. To prevent split ends, pay careful attention to them and protect them. When conditioning, make sure you thoroughly apply the product to the ends. Most women want long, healthy shiny hair and sometimes getting it can require some extra steps. While there are no true shortcuts to growing long luscious hair, there are many things you can do help your hair get there. The steps above are only a few things that you can do to make your hair grow. For more tips and tricks, visit hairfinity.com.